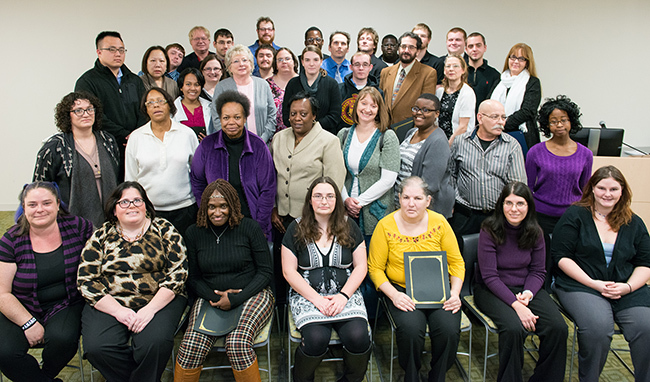 Montgomery County Community College celebrated the journey of 36 individuals who successfully completed the fall session of its innovative Partnership on Work Enrichment and Readiness (POWER) Program on Dec. 4 during a ceremony at the Central Campus in Blue Bell. 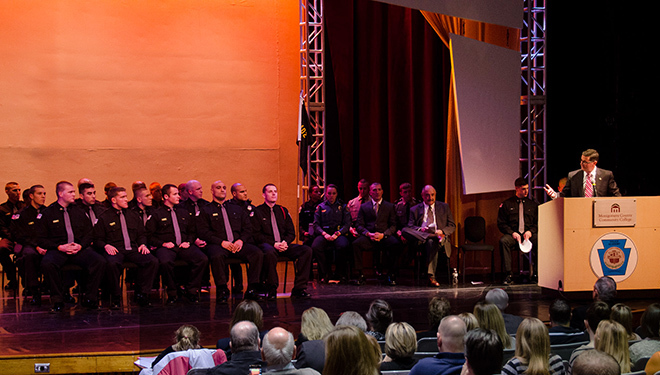 The fall 2014 cohort is the largest class since the program’s inception. For the graduates, the POWER Program gives them the confidence and skills they need to take the next steps in their lives. Several participants reflected on their journeys during the ceremony. 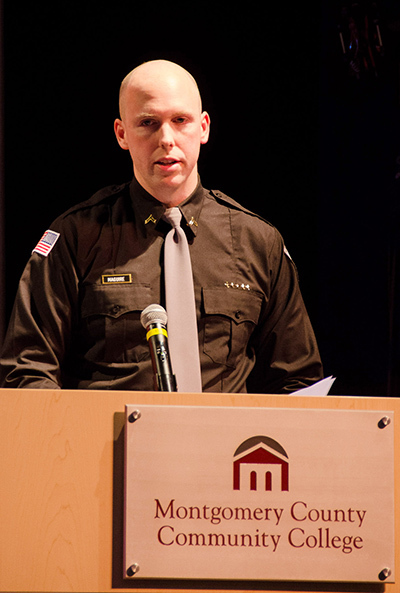 As part of the ceremony, 11 individuals were recognized for their achievements through the POWER Plus Program. These are former POWER participants who are now attending college classes or are currently employed as a result of completing the program. For the first time, POWER Plus offered two classes during the fall semester: POWER Employment Plus and POWER Education Plus. Many students choose to participate in both. Student Gail Tinneny participated in both POWER Employment Plus and POWER Education Plus while enrolled in the College’s Human Services program. “The POWER Program boosted my confidence and helped me and my boys get in the right path in life,” she shared. POWER Community Liaison Lori Schreiber presented a POWER Advocate Award to Eric Goldstein, who is retiring from his post as Administrator for the Montgomery County Office of Behavioral Health. “Eric has been our biggest supporter since we started this program in 2006,” said Schreiber, noting that Goldstein was an early advocate that individuals in mental health recovery can be successful students and employees, and not just patients. The College’s POWER team consists of Associate Professor of Human Services and Program Director Diane Harr; Program Coordinator/Advisor Lisa Barbiero; Community Liaison/Advisor Lori Schreiber; Employment Coordinator Tarsha Scovens; Faculty Byron Goldstein; Peer Mentor George Rohde; Administrative Coordinator Dianne Johnson; and Dean of Social Sciences Dr. Aaron Shatzman. Montgomery County Community College and the Office of Montgomery County Behavioral Health/Development Disabilities provide funding for POWER and POWER Plus Programs, which also receive support from the Huston Foundation, Patricia Kind Foundation, the OddFellows of Philadelphia and other private foundations. However, the programs are in need of funding to continue next year. Individuals interested in the POWER program may obtain a referral from their mental health or school provider or may self-refer. For more information, contact Lori Schreiber at 215-461-1151 or lschreib@mc3.edu or Lisa Barbiero at 215-641-6425 or lbarbier@mc3.edu. 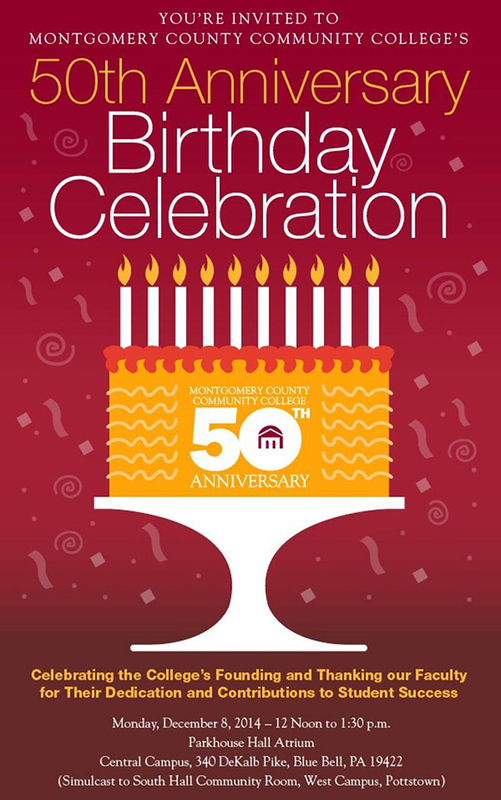 Reminder: Celebrate the College’s 50th Birthday Today! The program will be held in the Science Center Theater at the Central Campus, 340 DeKalb Pike, Blue Bell, with video-conferencing to South Hall 221 at the West Campus, 101 College Drive, Pottstown. The program is free and is open to the public; guests are encouraged to bring donations of non-perishable food for the College’s “Stock Up For Success” food pantry, which provides free breakfast and lunch items to students in need. Pre-registration is requested to Fran Wasserman at 215-688-0538 or franwasserman@verizon.net. The Straight Talk program will include a keynote address by Abby Grasso, social services liaison with Brooke Glen Behavioral Hospital, followed by a panel discussion and question and answer session. Panelists include Ron Husted, coordinator of the Fatherhood Program with Child, Home & Community, Inc., and Wendell Griffith, coordinator of mentoring services at MCCC. Literature and resources will also be available before and after the presentation. Montgomery County Community College will host two upcoming programs as part of its Business Leadership Series for Pennsylvania Career Link and the Montgomery County Employment Advancement Retention Network (EARN). Workshops on June 10 and 12 will focus on technology, manufacturing and service careers, while workshops on June 16 and 19 will focus on financial, insurance and service careers. On June 10 from 10 a.m.-noon, the College will host an Employer Summit, during which human resources managers from technology companies will discuss their expectations of job applicants in the areas of computer science, information technology, management information services, digital design and computer graphics. The summit is ideal for participants seeking technical as well as non-technical occupations, including accountant, administrative assistant, customer service representative, technician and other office, technical, non-technical and entry level positions. Participants will also learn basics of what to do, and what not to do, when applying for a position. On June 12 from 10 a.m.-noon, the College will host a hands-on workshop “How to Apply Online,” during which participants will learn how to navigate employers’ online application systems. Instruction includes how to post a resume and complete required testing, as well as information on testing strategies, test anxiety and stress. On June 16 from 10 a.m.-noon, the College will host a Financial Insurance and Service Summit, during which human resource managers will discuss their expectations of job applicants seeking employment with financial, insurance and service companies. Participants will also learn basics of what to do, and what not to do, when applying for a position. On June 19 from 10 a.m.-noon, the College will host a hands-on workshop “How to Apply Online,” during which participants will learn how to navigate employers’ online application systems. Instruction includes how to post a resume and complete required testing, as well as information on testing strategies, test anxiety and stress. The programs will be held at Montgomery’s Central Campus, 340 DeKalb Pike, Blue Bell and will include networking opportunities and refreshments. The programs are free and are open to the public, but registration is required, as seating is limited. To register, contact Denise Garrigus at 215-619-7403 or dgarrigu@mc3.edu or Jennifer Kirkwood at 610-278-7289 or jkirkoo@montcopa.org. Montgomery County Community College celebrated the journey of 19 individuals who successfully completed the spring session of its innovative Partnership on Work Enrichment and Readiness (POWER) Program on April 22 during a ceremony at the Central Campus in Blue Bell. A mother of three sons, Bennett is enrolled in MCCC’s Human Services program for the fall semester. POWER participant Leya Ross, who spoke about her struggle with post-traumatic stress disorder, will be joining Bennett in the Human Services program this fall. “I will be a confident, productive and successful critical thinker. I will carry everything I have learned for the rest of my life,” she vowed. Devon Heise was the final student to speak, sharing her emotional journey through years of drug abuse, incarceration, rehab and attempts at college. Going forward, Heise hopes to work with teenagers as a way to give back to those professionals who helped her. “Instead of letting my past mistakes define me, they now influence who I am today,” she shared. 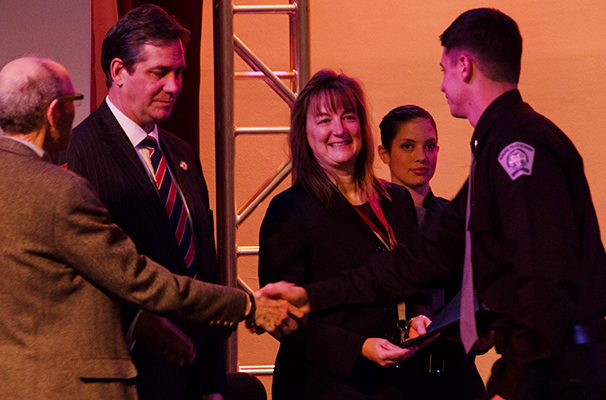 As part of the ceremony, 14 students were recognized for their achievements through the POWER Plus Program. These are former POWER participants who are now attending college classes or are currently employed as a result of completing the program. “I felt my mind expanding and myself improving already during [new student] orientation,” said POWER Plus participant Bob Maddox, who is enjoying his Spanish classes at MCCC and hopes to one day become a translator. Associate Professor of Psychology and POWER Program Director Diane Haar presented a POWER Advocate Award to Nancy Wieman, who is retiring from her post as Deputy Administrator for Montgomery County’s Mental Health Services after 28 years. In addition to Haar, the College’s POWER team consists of Program Coordinator/Advisor Lisa Barbiero, Community Liaison/Advisor Lori Schreiber, Peer Mentor George Rohde, Administrative Coordinator Dianne Johnson, Faculty Rose Regan, and Dean of Social Sciences Dr. Aaron Shatzman. Individuals interested in the POWER program may obtain a referral from their mental health or school provider or may self-refer. For more information, contact Community Liaison Lori Schreiber at 215-461-1151 or lschreib@mc3.edu or Program Advisor Lisa Barbiero at 215-641-6425 or lbarbier@mc3.edu.